This first appeared in the July 2010 newsletter. 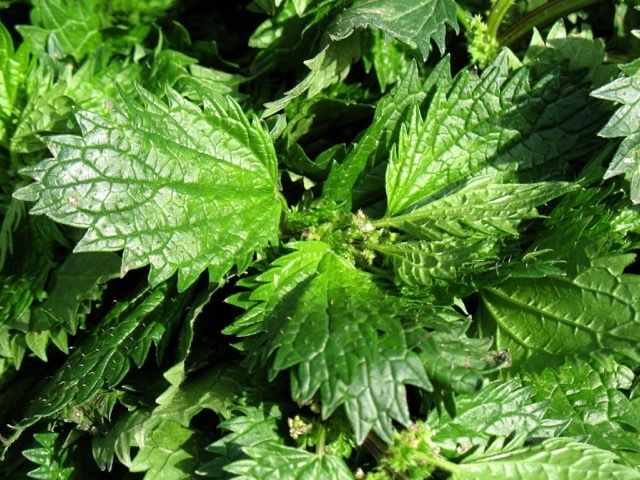 Don’t worry if you can’t find any nettles to use, just substitute with spinach or other leafy greens. My little garden, thanks to the plentiful use of organic cow manure, yields a herbal bonus each winter and spring. 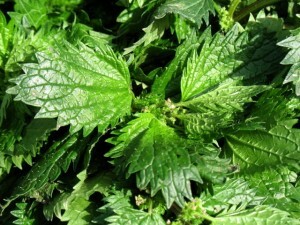 Without fail, once the weather turns cold, an abundant crop of nettles shoots up. These stingy critters make great tea or can be cooked like any other green vegetable. I particularly like them in an omelet. The following soup is adapted from Penny’s series of meatless Monday recipes and is my new favourite soup of the season. If you haven’t got nettles (keep an eye out for them at the farmers’ markets) use spinach or a mix of any other leafy green. If you are lucky enough to have some fresh sorrel it would make a lovely addition. Prepare your vegetables, as the soup will be blended it’s ok to roughly chop them. Choose a large, heavy based saucepan and place on a medium heat. Add olive oil and sauté the onions. You want them translucent rather than brown. Toss in the garlic and stir, then add the potatoes and cook for a few minute s. Next add the mushrooms and let them sweat a little. Lastly add the nettles/greens and nutmeg, allowing the greens to wilt before covering with vegetable stock. You want the fluid to come to about 3-5 cm about the vegetables, top up with water if necessary. Turn the heat down so the soup can gently simmer for about 30 minutes. Remember to stir every now and then and check there is enough water. When the potatoes are soft, blend with a stick blender til smooth and return to the pot to reheat. Now add the salt and pepper a pinch at a time and taste until seasoned. This recipe is vegan, gluten-free, dairy-free and paleo-friendly. * Never boil soup, for better flavour always cook at a low simmer. * Soup often tastes better the next day but don’t leave out on the stove overnight. * Store leftovers in a sealed container in the fridge. If you aren’t likely to finish the soup within three days of making, freeze portions within one day of cooking. If you’d like more recipe, explore the resources page. Iodine is essential to the production of thyroxine and can lead to an over production of thyroid stimulating hormone, which may cause a goitre or underactive thyroid. But if someone is on the verge of having an overactive thryoid, too much iodine can cause trigger hyperthyroidism. 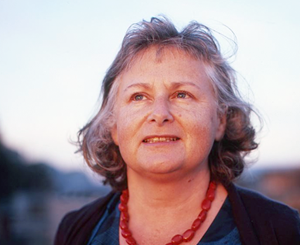 Since iodine was taken out of the milk production cycle (it was used to clean the milk tanks) people following the average Australian diet have been getting less incidental iodine. So yes, it does come back to the individual. What has also changed in my 18 years of practice is the amount of people who have an autoimmune thyroid problem (Hashimotos) that causes the body to make antibodies to destroy the thryoid. This is multifactorial and not really about iodine but is definitely on the rise. Anecdotally, I’ve seen a rise in hyperthyroidism post partum since iodine was added to the popular prenatal supplements. While it is reducing the amount of women who may be hypothyroid (under active) it appears to have created the reverse. So it’s a vexed issue. The bonsoy issue was fascinating as people with an underactive thyroid should avoid soy foods (and members of the cabbage family too), while seaweed is to be avoided in people with an overactive thryoid. Swings and roundabouts!